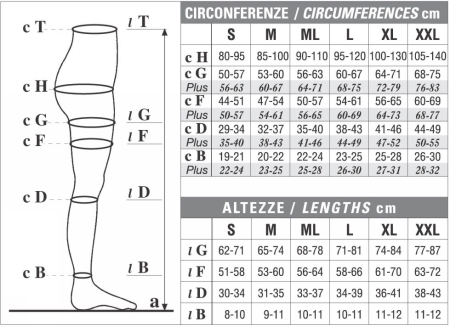 Men's tights with graduated compression, suitable for care of venous diseases with transverse opening specific for men. Created using the leading-edge technologies to give an extraordinarily elastic fabric that is easy to put on and comfortable all day long. In addition the silver ion bacteriostatic yarn controls proliferation of bacteria and prevents onset of bad odours. Graduted compression 18/21mmHg is suitable for treating varicose veins, large edemas and is recommended for post-variecotmy and post-sclerotherapy prophylaxis. The tights have a soft elastic waistband and an antistress sole. Flat seams and special front pouch with horizontal fly. Also available in open-toe style that lends comfort and is perfect for patients with diabetes, trophic skin disorders and in the case of bunions. To obtain maximum benefit from the stocking the leg must be correctly measured: for this purpose, technical or specialist assistance is recommended. The measurements should be taken preferably in the morning when the legs are less edematous. - Circumference of the ankle (cB), at the narrowest point. This is the point of maximum pressure. Click the button below to add the Dynamic Therapeutic Compression Tights for Men to your wish list.